There are all sorts of movies to watch for Christmas Eve. While the various traditional holiday movies are all good, I often prefer to see something that has the inner dynamic of Christmas – celebrating some surprising way in which the fullness of life comes into the world. 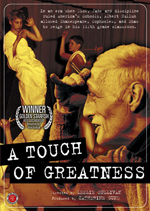 This year, I watched the documentary A Touch of Greatness. In the 1940s and 1950s, Albert Cullum broke all the rules of teaching. A friend who was a film-maker captured much of it on film: fifth-graders rallying to vote for Shakespeare, Shaw or Sophocles, or putting on Hamlet and Richard II, or creating a Mississippi River out of a long roll of paper and having the students swim its length on the huge map of America drawn on the school’s playground. The interviews with former students are interspersed, and it’s clear that Cullum’s methods made a lasting impact on many of them. The scenes I like best, though, came near the end of the hour-long movie. One of Cullum’s former students has himself become a teacher – and spoke about the difference in today’s school system. He speaks about the pressure to teach to the standardized tests, and especially about the differences in educational methods given to school in neighborhoods of different social classes. The children of the middle class are prepared for problem-solving and critical thinking, he says, while the children of the working class are prepared to careers in boring and service jobs. Pugh is still touched and inspired by Cullum’s methods and ideas, but finds that he has to re-shape them to modern times.